Today I tested out my new iPad as a word processing device. 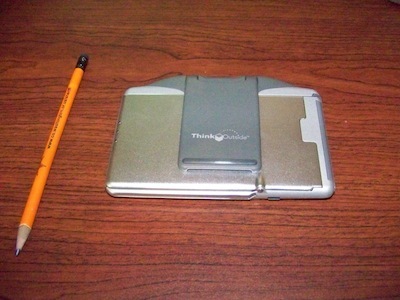 Deep in my box of old gizmos, I found a ThinkOutside Stowaway bluetooth keyboard. I was pleasantly surprised when it synced up with my new iPad without much fuss. It looks like ThinkOutside doesn’t exist anymore, so I had a tough time finding a manual for the keyboard on the Net. Here is the PDF manual in case you want to try this device for yourself. Turn the keyboard on by unfolding it. If there is no flashing LED, then press Ctrl and both the Function keys at the same time. A green LED should start blinking above the T key. This means the keyboard is in discovery mode. If the thing doesn’t blink, make sure it has fresh AAA batteries. Open the Settings utility on your iPad. Select: General >> Bluetooth >> On >> Devices >> Think Outside Keyboard. The iPad will prompt you to enter a five-digit code number. On the keyboard hold down the BLUE Function key and then enter the numbers. This is necessary because the keyboard shares numbers with the top row of letters. The iPad display should now say “Connected.” You can now quit the Settings application and start a word processing application. Which application is best to use? First I tried Google Docs. No dice. You can only display documents on the iPad, not edit them. Bummer. There is an app called Office2 HD that will make your iPad work with Google docs, but according to the reviews, it is really buggy at the moment. I personally didn’t want to purchase the Pages app either, since I don’t have it on my Mac and because it reportedly strips out the macros from Word docs. For now, I settled on using Evernote for raw text entry. It does autocorrect common spelling mistakes by default, and it automatically saves to the cloud, which is nice if you want to format and add links to your document later. Not a perfect solution but nice. Note that it doesn’t save your notes locally, so Evernote requires a WiFi connection to work on the iPad. If you are offline, the Notes app is fine for text entry. I will try to finish this article on Notes to see how that goes. The Stowaway does have a stand for your iPad, but it wasn’t designed to hold up anything this heavy. As a result your iPad will fall backward easily, which is not good. 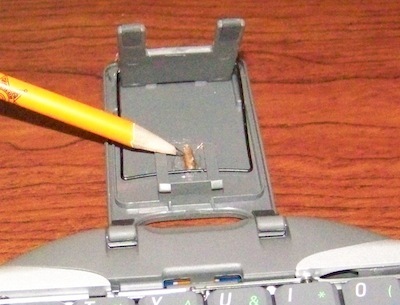 Making the keyboard into a steady, reliable stand is going to require a small modification. While there are probably a lot of ways to do this, I elected to glue a toothpick onto the base of the keyboard stand. This provides a “bump” that prevents the stand from reclining past it’s first position. There are likely many ways to accomplish this objective, but this one does the job and does not interfere at all with the folding of the keyboard when you’re done. So now that I have determined that it is possible to use the iPad as a decent word processor, the question in your mind has to be: Why not just use a laptop? Well, the answer for me comes down to portability and battery life. With my leather sleeve case, the iPad is as easy to carry as a small book, so I don’t need to haul a backpack around anymore. And with it’s ten hours of battery life, the iPad works all day without needing to plug into the wall. In other words, it’s about freedom, and who can knock that? 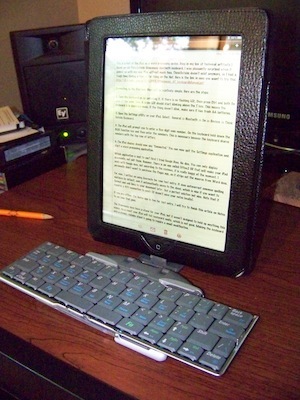 I was also pleasantly surprised when my old stowaway keyboard worked with my iPad pairing with it without much fuss. 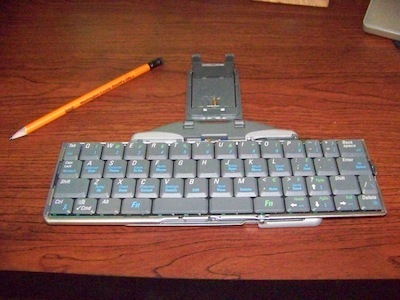 Now this thing won’t work with my Pocket PC (which was the reason I bought this keyboard, anyway). If only all gadgets work this way.